Nanami is Phantom Quest's newest employee. Her first task would be a dangerous one, but she agreed to it. She was to be the bait for the demon doctor so that Ayaka can corner and eliminate the demon. However, after being exorcised from the doctor, the demon made a run for Nanami in the operating room. However, for some reason (perhaps Ayaka) Nanami awoke and quickly became terrified, and let loose her secret: she sent flames flying throughout the operating room, burning the demon. 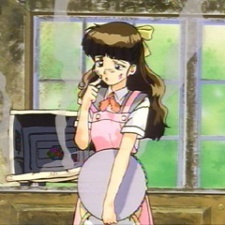 Nanami is a pyrokinetic, able to convert her psychic energy into fire. When Ayaka found her, Nanami was still untrained in her power, and thus she lacks control. Whenever she gets spooked, she has a tendency to create a large, sudden burst of flame.